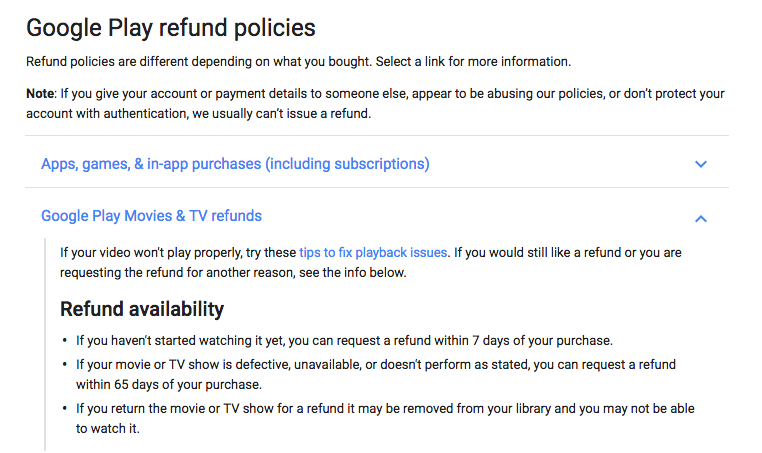 In a odd turn of events, Google has decided to reduce the return window for defective movies, books, and TV shows bought in the Play Store to 65 days. Originally 120 (or unlimited for books), this change is interesting to note with the impending holidays (and hopefully an influx of Google Play gift cards). "If your movie or TV show is defective, unavailable, or doesn't perform as stated, you can request a refund within 120 days of your purchase." "You can return most books bought on Google Play for a full refund within 7 days of purchase. If they don't work, you can request a refund at any time." Now both mention a refund window of 65 days. I have no idea why Google would make this change, but I don't think it's any problem. If your movie, TV show, or book won't open or doesn't perform as claimed, 65 days is a very long time to not only realize that, but also get your money back.